There are several different ways to use a microscope to take dimensional measurements. Which one is right for you will depend on your accuracy requirements, the physical size and characteristics of your target and the feature involved, your magnification requirements, and of course your budget. Fortunately, we offer a wide variety of solutions to fit your particular application. 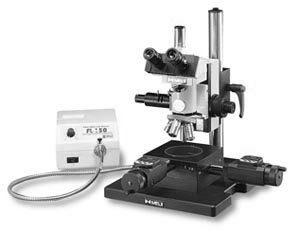 We offer the complete line of Japanese-made Meiji Techno performance microscopes. These are world-class systems with the best optics, yet are surprisingly affordable. They allow measure­ment in the X, Y and Z axis. Can add a camera, reticle, polarizing filter, etc. Please contact us to configure the best system for your application at the best price. You knew technology would step in and offer a great solution at a great price! These cameras have the ability to mount to virtually any micro­scope, and connect to your computer via the USB port. By calibrating the software with the included optical calibration standards, you then have the ability to take accurate measurements from the image on your computer screen with the click of a mouse. Length, angle, area, you name it. Plus you can annotate your image, draw arrows and features on it so everyone can understand exactly what you're seeing. Need someone across the building, or the world, to see what you see? Video Conferencing is built in! See more in our camera section and our software details page, plus we have a line of microscopes with digital cameras built in. Then there's the tried-and-true method...the eyepiece reticle, a.k.a. eyepiece micrometer. We have almost 400 different designs and each design is available in a couple dozen different diameters so we're sure to have one to fit your microscope. Measuring with a reticle is simple, the most common and least expensive method, and, with our huge variety of patterns, allows tremendous flexibility. Plus, if your requirement is unique, we can generate a custom pattern to make sure it fits your application perfectly. For even more accuracy, you can calibrate the reticle to your specific microscope's optics with another optical standard called a stage micrometer. It is typically a 1 x 3in. glass slide with a highly accurate pattern printed on it in chrome. It's also available with NIST traceable calibration.